I love some Mellow Mushroom pizza! Over the warm months my husband and I would take lunch dates to sit on their patio while indulging in my favorite pizza-the “Mellowterranean.” It’s served on their famous crust (with a secret ingredient of molasses!) with an olive oil and garlic base, mozzarella, chicken, red onion, and feta. Delicious. 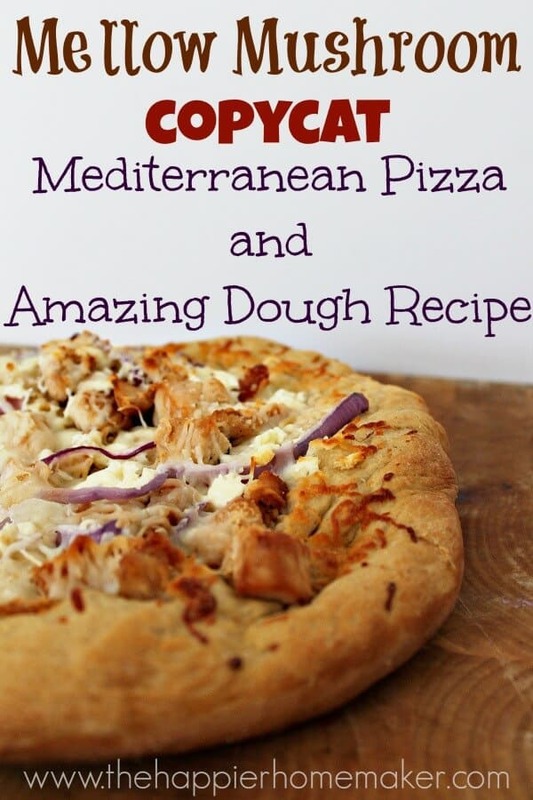 I recently perfected my own version of the pizza complete with a copycat of the Mellow Mushroom pizza dough recipe to make at home after a lot of internet research and trial and error and I’m excited to share it with you today! A few things before the recipe itself I wanted to mention…. You DON’T have to have a pizza stone to make a great pizza. I’m sure it’s nice but honestly in my research if I had believed all the hype about how I absolutely had to preheat my oven to 500 degrees for an hour beforehand, and how I simply must use a pizza stone, blah, blah, blah I probably would have never tried to make my own pizza and I would have really missed out. I don’t have a pizza stone nor do I preheat my oven for an hour before making my pizza. (Ain’t nobody got time for that, am I right?) I make mine on some ancient cookie pans in a minimally preheated oven and they turn out just fine thank you very much! You DON’T have to do some fancy schmancy pizza toss in the air or crazy dough rolling technique to get a great tasting pizza…it might look a little prettier but it’s not going to taste bad if you use simple techniques. (Forgive the crazy fuzzy picture, I had my 5 year old take it and it was night time!) I shape my dough by flatten it out then holding it in two hands and allowing gravity to stretch it downward…do this and slowly turn and rotate letting the dough stretch itself out. And lastly a little tip-for restaurant style pizza crust, try dusting your cooking surface with cornmeal before baking. 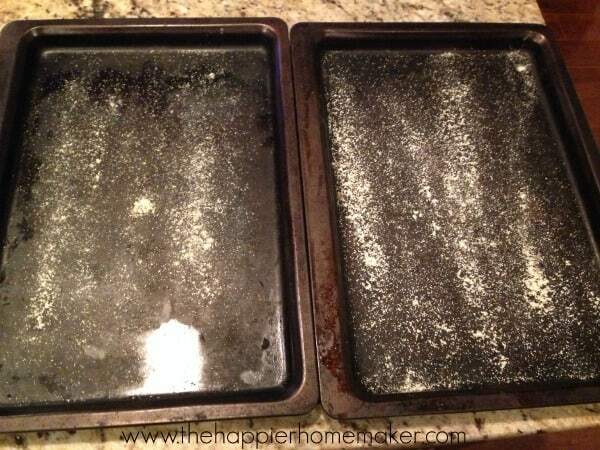 If you’re using a baking sheet like I do simply dust some across the sheet. If you form your crsut on parchment paper, add it before putting your dough down. Okay, off my little pedestal now, I hope you LOVE this recipe as much as we do at my house! 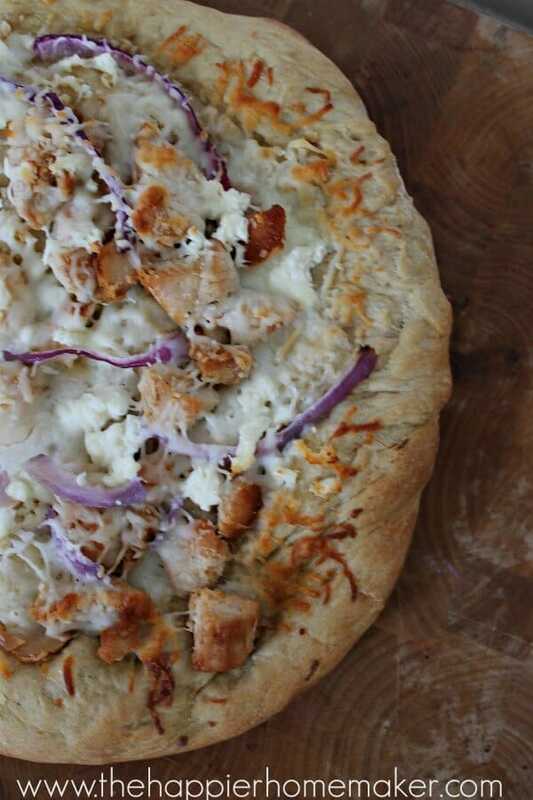 This Mellow Mushroom inspired pizza has a crust even crust-haters will eat up! The secret ingredient is molasses! In a small bowl combine water, olive oil and molasses. In a stand mixer combine flour, gluten, yeast, and salt. Add water mixture to stand mixture and mix on low using dough hook for 30-60 second until combined. Switch speed to medium for 12 minutes. Form dough into ball and place in greased bowl. Cover bowl with loose plastic wrap and let sit at room temperature for 2 hours. Cut dough in two and roll each into a tight ball by folding the edges into the center. Allow dough to rest covered for 30 minutes. Form each ball into crust by stretching the dough in two hands while rotating it. brush crust with olive oil and add minced garlic. 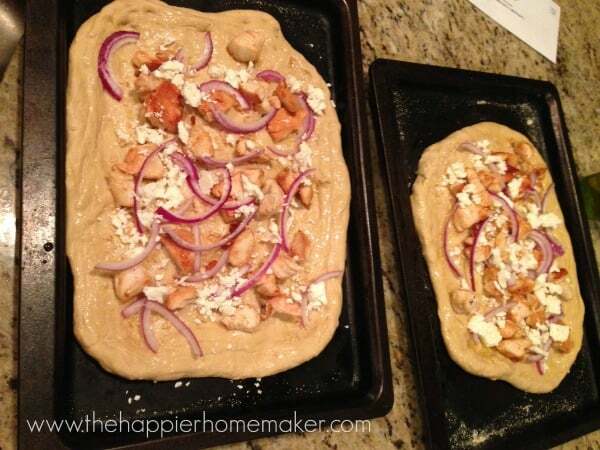 Top with chicken, onions, feta, and mozzerella cheese. Bake 7-9 minutes until golden. After removing from oven immediately brush crust with melted garlic butter and top with parmesan if desired. next post: Silhouette Sale and Announcing The Silhouette Challenge! Definitely going to have to give this a try! Mellow Mushroom is one of our favorite pizza places, but it’s a 45 minute drive to enjoy it! Thanks! I’d love to hear what you think, it’s my new favorite!! Melissa, you just made my night! I just came across your blog and am so happy. We recently moved from the south up to Maryland (where there are no Mellow Mushrooms). Going to try this recipe this weekend. Oh no Kristen! We’re military and supposed to move to DC in a few months and now I’m off to google whether there are Mellow Mushrooms up there, I didn’t even think of that! I hope you love the recipe as much as we do! We are military too! Hoping you find one that will be close, I think there are some in Virginia. I don’t have active wheat gluten. Does it make a big difference in the dough? Is wheat gluten available in your average grocery store? The wheat gluten makes the dough lighter with more air pockets. It should be in the baking aisle at any grocery store, I got mine at Walmart. What if I don’t have a dough hook? What else can I use? 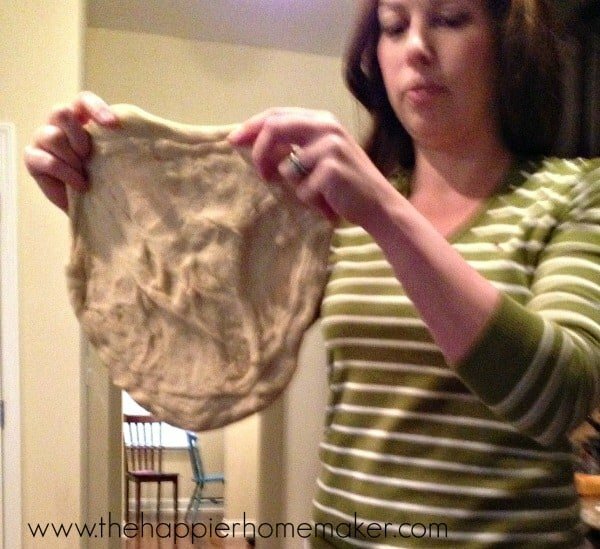 You can knead it by hand and get the same result Jessica! You can’t put yeast and salt together, the yeast won’t activate. I think you meant to have the yeast in with the warm water and molasses to proof, then add it to the flour, vital wheat gluten and salt. And why the wheat gluten? Why not use bread flour for a better rise or are you at a high altitude? I do put the yeast in with the dry ingredients and haven’t had any issue with rising. I don’t buy bread flour because I find that adding the wheat gluten gives me the same result without having to have so many different types of flour in my pantry! I’ve frozen the dough just fine Jessica. The wheat gluten is in there to make it a little airier so I’ve love if you let me know how it turns out without it! Hey, just wanted to let you know I tried your Mellow Mushroom crust recipe tonight. Very close to the original, we enjoyed it very much and I plan to make it again. Thanks for sharing this recipe! That’s great Dan, I’m so glad you liked it! Thanks for taking the time to let me know how it turned out for you! I plan to make this pizza this week. I was looking for a ‘wheat’ pizza doe and planned to use wheat flour instead of white. I have not worked with the wheat gluten, so if I use wheat flour, do I still need the wheat gluten? Or by using the wheat gluten in regular flour, is that the same as using wheat flour? Hi Pamela, You can make the dough without the added wheat gluten, but it will not have the same chewiness in it. I like the texture of the dough better when I add the gluten, it reminds me more of authentic Italian pizza crust. Either way, I’d love to know what you think of the recipe after you try it! How much cornmeal do I add?